For me, these words are the most profound and thought-provoking I’ve read about Syria. I read them every day. I’ve been observing and researching events in Syria and western government’s role in the chaos for some years now. I have also been thinking about faith and wondering if a god plays a role in world events. I think all people, religious or not, who care about humanity will take strength from the resilience of the Syrian people in the face of overwhelming odds. If you look back to the start of the conflict and subsequent years, Qatar and Saudi Arabia funded ISIS and Al Qaeda in Syria and many parts of the country were under terrorist control. At one point it looked as if they might succeed and possibly result in over 15 million Syrians fleeing the country. The US, UK and France (who were also more covertly involved from the start) revealed their hand. These countries bombed Syria and set up illegal bases which provide ISIS and Al Qaeda a free pass to commit atrocities in the remaining areas they control. Turkey and Israel have also been active in the war, Israel almost on a daily basis bombing the Syrian army and arming the extremists. Russia, Iran and Hezbollah helped turn back the tide but the bravery and unity of the diverse Syrian army and people is what determined the outcome of the conflict. Senator Black is right – in a military sense, you can’t explain how Syria has prevailed over this combined evil using bombs and ethnic and religious intolerance as tools of regime change. In recent years I’ve sensed something has changed within me and I link this partly to events in Syria and the war crimes being committed by the West and support for terrorism masquerading as ‘humanitarian’ intervention. Rather than be consumed by outrage and burdened by the disturbing knowledge I now possess, I seem to have acquired some kind of ‘faith’. I’m not sure if this faith is spiritual or based on what I’ve observed over the years – or both. This faith is centered on a belief that good eventually prevails over evil. Nowadays I go out of my way to help others who are vulnerable. I have a confidence in my abilities which was never there before. It’s hard to explain but I feel I’ve had a ‘helping hand’ to work through some personal mental health issues and put things into perspective. I believe this renewed strength has come about much through observing the resilience of the Syrian people fighting heroically to protect the unity of the many ethnic groups and religious faiths living side by side. I feel privileged to use my knowledge and ideas to spread this inspiring message through my writing. At the moment I’m also spending time learning about religion particularly in the context of what’s going on in the world. I guess in my younger years I would’ve described myself as agnostic but more tending towards atheism. But I hadn’t really studied religion and kept an open mind on the subject until I had more time to explore it and think. Senator Black’s mention of God reminds me of a book I read recently. 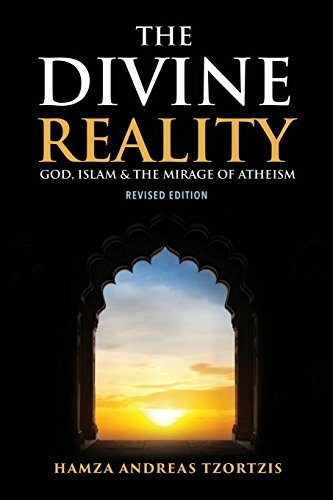 It is called The Divine Reality and is a good starting point for those who wish to understand the main arguments in favor of theism and atheism. The book is more focused on Islam. For a book promoting theism, as a relative learner, I was surprised to find it had some very rational arguments, about the precision of the universe, and for example, the position of the planets and sun seems too perfect to happen by chance. The author of the book argued that science has not provided adequate explanations for our existence and in their absence theism has to be considered. The author confronts this common objection. He explains that God gives us the tools to be good people and do good things. Worshipping God is not just about praying but doing good deeds in our everyday life. In a way, life is like a test to see how we get on and use the tools. He states that people who pass the test will be rewarded in this or the next life but those who do bad consistently and don’t change will suffer. The author adds that those who suffer injustice or die at the hands of evil are also recognized. So the view seems to be if there’s a god, intervention to prevent injustices on a day to day basis is not how it works and it’s largely up to us to live up to decent values. But looking at history you can see a pattern where wholesale injustice inflicted on many were finally corrected one way or another. For example, the Nazis were allowed to destroy much of Europe but is there a god that decided in around 1942, that enough was enough and intervention of a godly kind was the only way to defeat the tyranny? The arguments in the book are well written and comprehensive and I tend towards the side of theism. But I’m still studying this with the combined mindset of the rational arguments and the ‘faith’ I’ve acquired recently. Looking back at 50 years of destruction in Vietnam, Iraq, Libya, Yemen and countless other states, could it be that if there is a god, it’s been decided enough is enough and the red line is over Syria? The victors and victims on the right side of history during World War Two such as US, Britain, Israel and France, today have become so utterly depraved and corrupt that they resemble the forces of darkness that they were fighting in 1942. Although Syria is recovering there is still a grave danger. This conflict is a proxy war being fought by the major world powers. Fault lines are opening up all over the Middle East between these powers. The trade war with China and aggressive rhetoric and disturbing anti-Russian narratives in the West are unprecedented. Any historian or geopolitical expert studying these conflicts and recent events would be hard pressed to see how global conflict can be avoided. The signs are a major conflict could be soon. So perhaps we should take heart from the miracle in Syria and hope that a kind of godly intervention played a part. If so, perhaps there is some hope for the wider world and we can avoid global conflict by removing the criminals and lunatics in our governments and media who keep pushing for more war. Maybe we are at a crucial tipping point and there is a god providing us with the tools to remove the enemy from within – and we should use them. Perhaps God is testing us again, watching if we wake up and confront these issues or carry on as we are, remaining oblivious to the suffering our governments are causing in our name. And whether as individuals we are active in taking up the tools against the enemy within our elites, all citizens should consider re-setting our basic values and priorities towards awareness and respect for humanity beyond our shores. Above all, we should all show solidarity and respect for the true heroes of the day – the Syrian people. This is not lecturing to the many wise readers. I’m sure everyone here are pillars of their own community. But this year, I’ve particularly noticed that many people are distracted and stressed by Christmas – and not in a good way. Going to work this week I’ve nearly been run over by impatient traffic and pushed back on to London tube trains (more than usual) when trying to get off. One suggestion I would have for all is to consider my positive experience, take some time out to be more self-aware and tolerant towards all. Help someone – perhaps a vulnerable neighbor and make an effort for one act of kindness towards someone outside of your immediate family or circle. Once you’ve done that, see if any negative energy triggered by the stresses of Christmas – or the burden knowing the true state of the world reduces. It did for me and I’ve not looked back.